For as long as we can all remember, Labor Day has represented both the unofficial end of summer as well as the opportunity for hard-working Americans to make one last great escape to the coast of their choosing. 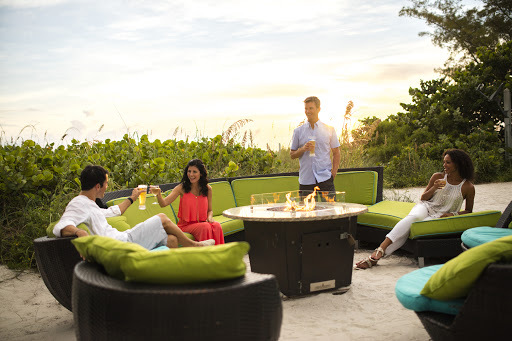 TradeWinds Island Resorts on St. Pete Beach has a long standing labor Days tradition all its own, bringing the heat every year with one giant beach bash that keeps the fun going all weekend long. Between cookouts, contests and celebrations, the only place to send summer off with a bang is right on one of the top beaches in the U.S. with their Off the Clock and On the Beach package. Say sayonara to one season and welcome another with the ultimate beach getaway full of food, fun and fireworks. At TradeWinds, the shoreline lends itself to ample holiday hoopla for thrill-seekers, sun-worshipers and families alike. The entertainment really heats up with the annual Off the Clock & On the Beach party and cookout, where all of your favorite summer foods are accompanied by tons of fun! Fill your plates with classics like seafood gumbo, peel and eat shrimp, grilled Black Angus hamburgers, kosher all-beef hot dogs, Kalik braised BBQ beef short ribs and Caribbean jerked bone-in chicken. The sides are show stealers themselves! Lining the buffet are all of the baked beans, sweet potato salad, grilled corn on the cob and southern style braised collard greens you could want to pile your plate high with. It wouldn’t be a true Labor Day celebration without chocolate fondue, key lime pie, assorted mousse shots and even an ice cream sundae bar. Following the endlessly enticing fare is all of the sugar-fueled fun! Discover a hidden talent in hula hoop, limbo and other games of skill. You may even take home a trophy. Bring home a short-term souvenir in the form of a temporary tattoo. Who knows, you may just want to sit back, catch some rays and enjoy the DJ playing your favorite tunes! There’s plenty of room on St. Pete Beach for sun seekers looking for a little peace and quiet too. Take advantage of one of the secluded hammocks dotting the dunes all over TradeWinds Island Resorts. Slip a floating cabana into the warm waters of the Gulf of Mexico for the ultimate in recreation and relaxation or opt for the land bound version. The piece de resistance is certainly the booming beach fireworks display at dusk, popping right over the sparkling Gulf of Mexico. This annual event always leaves guests in awe. TradeWinds’ Labor Day activities don’t stop at just the holiday events, either! One of the biggest perks of the Labor Day Endless Summer Package is the resort amenity fee is included. That means unlimited rides on the High Tide Slide, plenty of chances to take on the Surf WipeOut, leisurely coasting down the waterway on paddleboats, staying fit with complimentary resort beachfront fitness classes and sweetening the sunset with s’mores! One of the best features of the resort amenity fee is an absolute necessity on such a busy holiday weekend. With a motto like “Just Let Go”, there’s no better place to celebrate a holiday centered on relaxation and fun in the sun. With more holiday activities to do (or not), TradeWinds Island Resorts on St. Pete Beach is the ultimate Labor-free place to be!